In late September 2016, I had the opportunity to put my UAS drone pilot certification to use on an exciting project on behalf of DJS Associates: The comprehensive documentation of a historic icon, the Ferryboat Binghamton. Working with RGA, Inc., DJS was contracted to collect critical measurement information, in order to help satisfy proper documentation protocols for sites that appear on the National Register of Historic Places. The Binghamton had been closed for several years after experiencing a second life as a popular floating restaurant on the edge of the Hudson River in Edgewater, New Jersey. 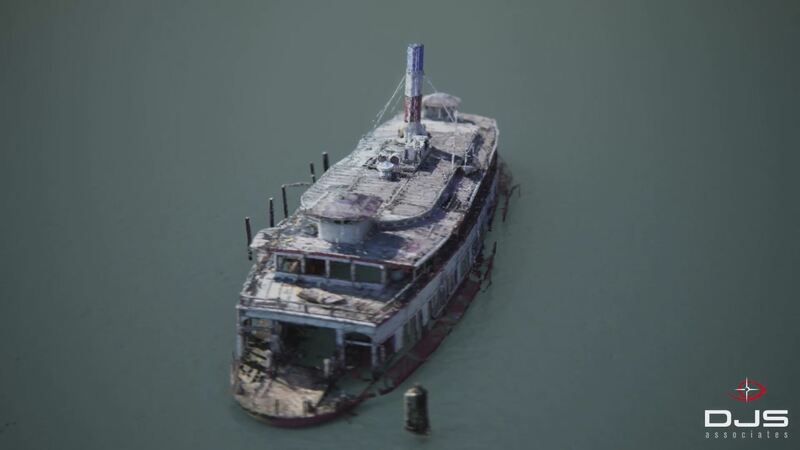 Hurricane Sandy devastated the abandoned ferryboat in 2012, and left it unsafe for boarding. DJS was able to combine 3D laser scans, taken from the shore, with 3D point data produced through photogrammetric image processing of photographs captured with the drone, to produce a highly accurate, 3D digital measured version of the Binghamton. This data was then utilized to produce the required CAD elevation views, satisfying the need for accurate documentation prior to demolition. Demolition of the Binghamton began in late July 2017, and is now complete. Jon W. Adams, Director of Architectural & Heritage Services with DJS Associates Inc., can be reached via email at experts@forensicDJS.com or via phone at 215-659-2010. Enter your name and email below to recieve our blog posts straight to your inbox.